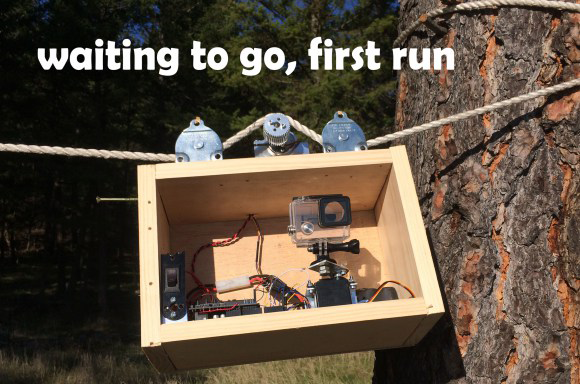 [David Schwarz] whipped up this moving time-lapse camera rig and won himself a sweet Nikon setup. You might remember our post about the Nikon Make:The Shot Challenge. [David] saw our post, and started thinking about what he wanted to enter. Like a true engineer, he finally came up with his idea with just 3 days left in the contest. [David] wanted to build a moving time-lapse rig, but he didn’t have the aluminum extrusion rails typically used to build one. He did have some strong rope though, as well as a beefy DC motor with a built-in encoder. [David] mounted a very wide gear on the shaft of the motor, then looped the rope around the gear and two idler pulleys to ensure the gear would have a good bite on the rope. The motor is controlled by an Arduino, which also monitors the encoder to make sure the carriage doesn’t move too far between shots. [ David] built and tested his rig over a weekend. On Monday morning, he gave the rig its first run. The video came out pretty good, but he knew he could get a better shot. That’s when Murphy struck. The motor and controller on his rig decided to give up the ghost. With the contest deadline less than 24 hours away, [David] burned the midnight oil and replaced his motor and controller. Tuesday morning, [David] pulled out his trump card – a trip to Tally Lake in Montana, USA. The equipment worked perfectly, and nature was cooperating too. The trees, lake, and the shadows on the mountains in the background made for an incredible shot. Once the time-lapse photos were in the can, [David] rushed home, stitched and stabilized the resulting video. He submitted his winning entry with just 2 hours to spare. Click past the break for more on [David’s] time-lapse rig, and to see his final video. Several juicy prizes from Nikon are ripe for the plucking. Our friends at MAKE are hosting a Nikon sponsored challenge. Grand prize is an Nikon 1 V3 with three extra lenses, and there are two runner-up prizes which offer the same without the extras. They’re basically asking for your best camera hack. Now the submission process is a one-shot deal (no posting and iterating) which may explain why the contest — which started 4/15 and ends 5/13 — only has two entries. Still, we’d love to see a Hackaday reader waltz in and claim the loot. Need some examples to get you rolling? 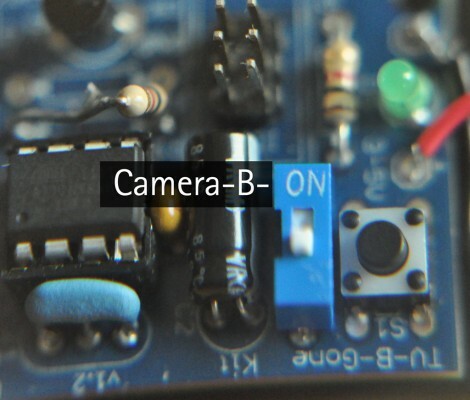 Connectivity is a fun topic; try interfacing your camera with something like a Nintendo DS. Everyone needs to make at least one motion rig like this Ikea slider. We can’t stop listing examples without at least one shutter trigger. Here’s a sound activated one to capture things that happen extremely quickly. If you end up winning make sure to tell us so we can share in your delight. Here’s a pretty tricky piece of consumer electronics reverse engineering. [Joe Fitz] came across the Nikon WU-1a. It’s a dongle that plugs into a Nikon D3200 camera, producing a WiFi connection which can be picked up and controlled from a smart phone. The app shows you the current image from the viewfinder, allows you to snap the picture, then pulls down the picture afterwards. The problem is that the same functionality for his D800 camera will cost him $1200, when this dongle can be had for $60. That’s a powerful incentive to find a way to use the WU-1a with his camera model. This is more than just rerouting some wires. It involves sniffing the USB traffic and drilling down in the datasheets for the chips used in the hardware. We’re not certain, but he may have even rolled new firmware for the dongle. Details are a bit scarce right now. Your best bet is to watch the video embedded after the break. There is also a set of slides which [Joe] put together for a talk at this weekend’s BsidesPDX. It will give you a general overview of the process he went through. But he also started a forum thread and we hope to learn much more from that as the conversation gets going. [Christopher] found a way to get a bit more mileage out of his TV-B-Gone kit. The little device is intended to turn off every television in range with the push of a button. But at its core it’s really just a microcontroller connected to some infrared LEDs. Instead of sending codes to shut of televisions, you can rewrite the firmware to send a camera remote shutter release code. It doesn’t take too much to pull this off. You need a way to flash new firmware to the device, and you need to know the new code timing that you want to send. Since the firmware is open source it’s easy enough to make code changes, and there are several easy methods of flashing AVR devices (like the tiny85 used here), including using an Arduino as an ISP. But [Christopher] did more than just add the Nikon code for his camera. He realized that there’s a jumper to select between European or American television codes. Since he wasn’t using the foreign option, he replace that pin header with a switch that selects between normal TV-B-Gone operation and camera shutter release modes. Nice.